Introducing New Solutions Aluminum Shell Backs. Constructed of aluminum, these backs are lightweight, strong, and durable. 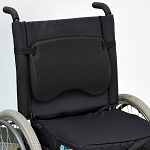 Features a special dual density foam for comfort and support. 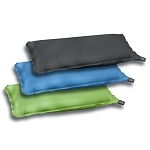 The cover is made of an automotive grade, breathable and washable material to provide more air flow. This standard back is available in 16", 18", or 20" heights with a 4" contour. Available in 3 widths: 16", 18" or 20". Manufactured in the USA!